Stories about land that has been confiscated from them echo in the family histories of the vast majority of Indigenous people, says Alan Salazar, a Chumash and Tataviam elder and educator. Alan Salazar, a Chumash and Tataviam elder and educator, spoke of his family history. 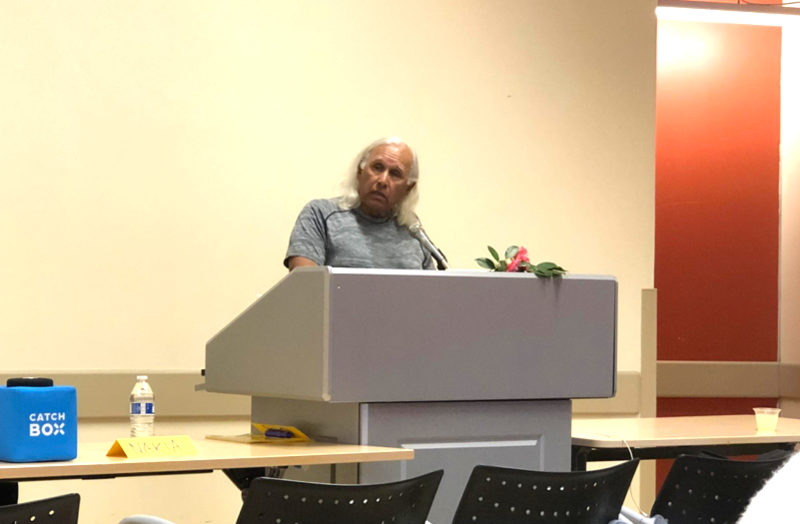 Salazar was one of several participants who spoke to an attentive crowd during the 6th Annual American Indian and Indigenous Collective Symposium held recently at UC Santa Barbara, sponsored by the Interdisciplinary Humanities Center. “My family is not unique and there is nothing special about them,” said Salazar. Still, his ancestors battled indentured servitude and subordination by European colonists. Colonization in North America initiated a domino effect that has disoriented Indigenous peoples. The three-day symposium sought to create a platform for a modern conversation about colonialism from the Indigenous perspective. Panelists discussed topics such as the untimely deaths of family members from smallpox and other foreign diseases, to how their Indigenous roots have driven them toward success in academia by motivating them to change how Indigenous history is written in American textbooks. Question and answer sessions challenged both audiences and moderators to find ways to strengthen Indigenous identity through self-reflection. Writer-performer Brooke Smiley took the event outdoors with “Other than Trauma,” a spoken-word and dance hybrid that connected her to her body, her lineage, and the earth around her. Megan McMurtey, event organizer and current doctoral student in Native American religious traditions. Decolonization means taking action to encourage movement away from the Western attitudes and cultural norms introduced by colonialism that still persist in today’s society. The term itself is contentious within the Indigenous People’s Movement because it is seen as a goal but not an endpoint, since ongoing work will be needed to revitalize cultures and identities. Still, those at the symposium appeared to agree that pursuing decolonization plays an important role in developing a relationship with one’s Indigenous roots. Kathy Bolivar, a teacher on her reservation in Southern California, helps children in her community build that relationship through language. While fluency in many Indigenous dialects is fading, Bolivar said she is inspired by hearing children use her native language day to day. “After classes, even hearing simple ‘hellos’ and ‘goodbyes’ makes us smile and give us hope the language will carry on,” she said. Salazar said he strengthens his relationship with his Indigenous roots by interacting with the natural world, canoeing and doing archeological fieldwork. Both spiritual and medicinal aspects of Chumash and Tataviam practices are tied to the Earth, he says. “Even at 68 years old, I am still able to connect with the earth while I walk on the beach as the sand cradles my feet,” he said.